He is on the way to 3rd place in the race won by Mika Hakkinens’ McLaren MP4/13 Mercedes, Mika also winning the title that year. 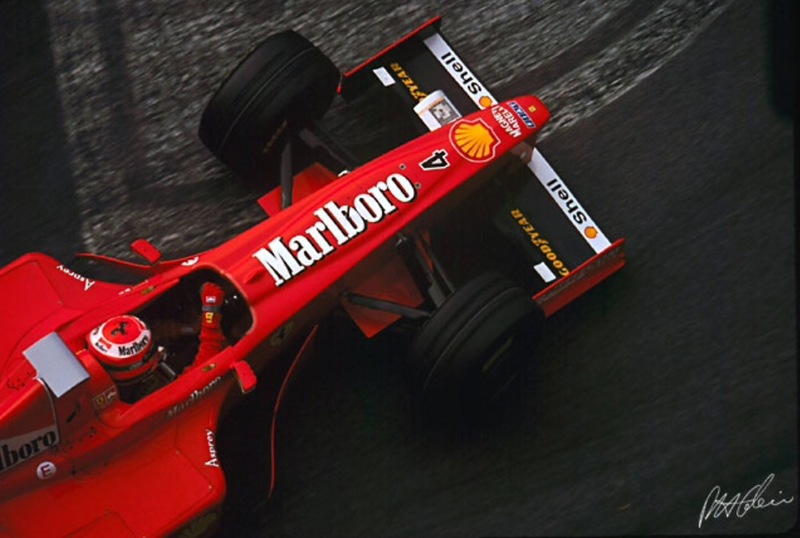 Eddie didn’t take a win but was on the podium eight times finishing 4th in the drivers championship behind Hakkinen, his teammate Schumacher and Coulthard in the other McLaren. 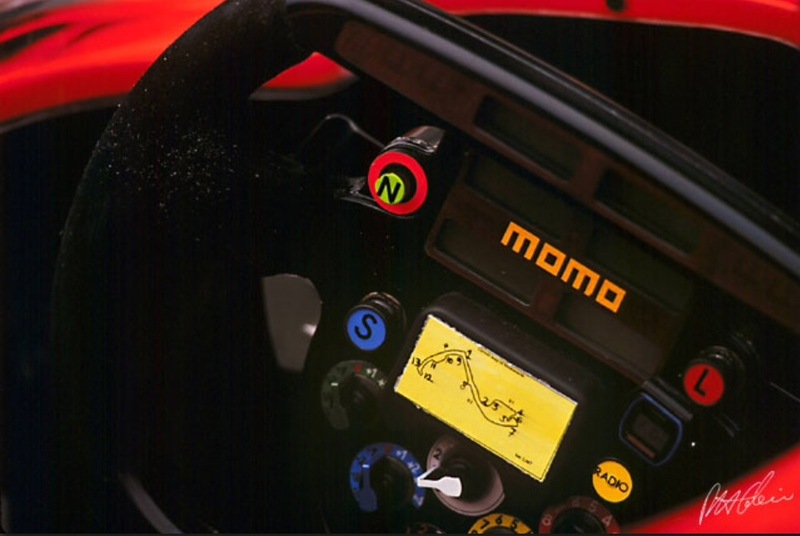 The F300 was designed by Rory Byrne to the narrower track regulations mandated by the FIA that year. The chassis was of course carbon fibre honeycomb, suspension comprising upper and lower wishbones front and rear with pushrod actuated coil spring/damper units. Brakes are ventilated carbon fibre discs. Weight 600kg with driver. 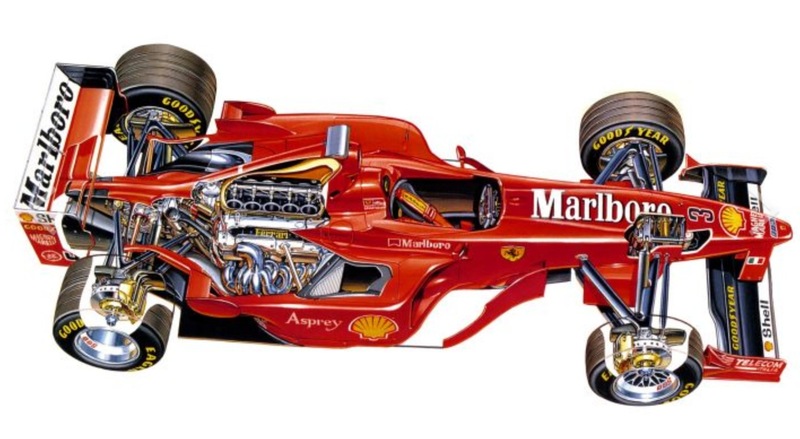 The engine was Ferrari Tipo 047, a 2997cc normally aspirated 80 degree, 40 valve V10 delivering circa 700bhp. Transmission is a longitudinally mounted semi-automatic sequential 7 speed transaxle incorporating a ‘slippery’ diff. 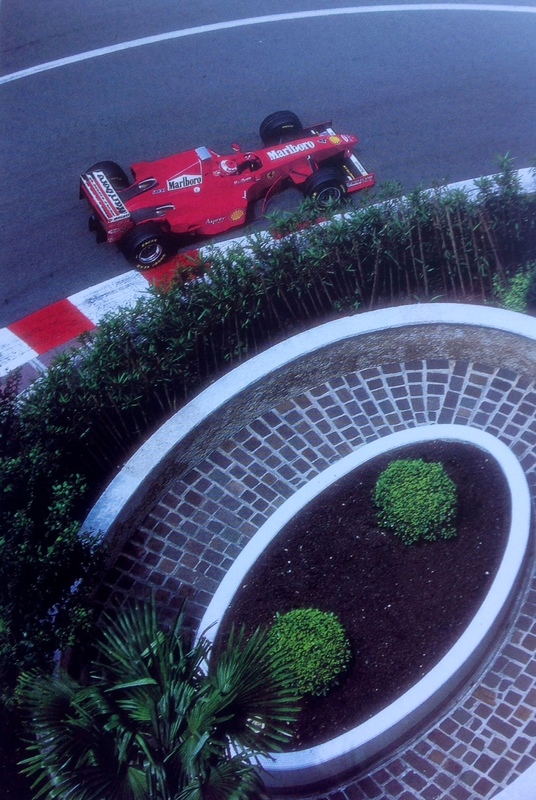 Paul Henry Cahiers’ shot of Irvine at Monaco during the race…F300 considered aerodynamically inferior to the McLaren MP4/13 but Schumacher won 6 races the car setting up the dominance of Ferrari in the decade to come. 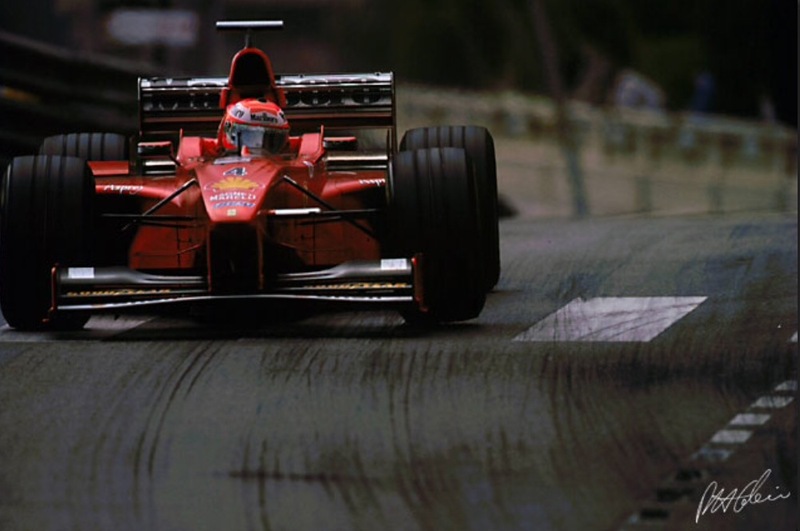 Ferrari 2nd to McLaren in the constructors championship in ’98. 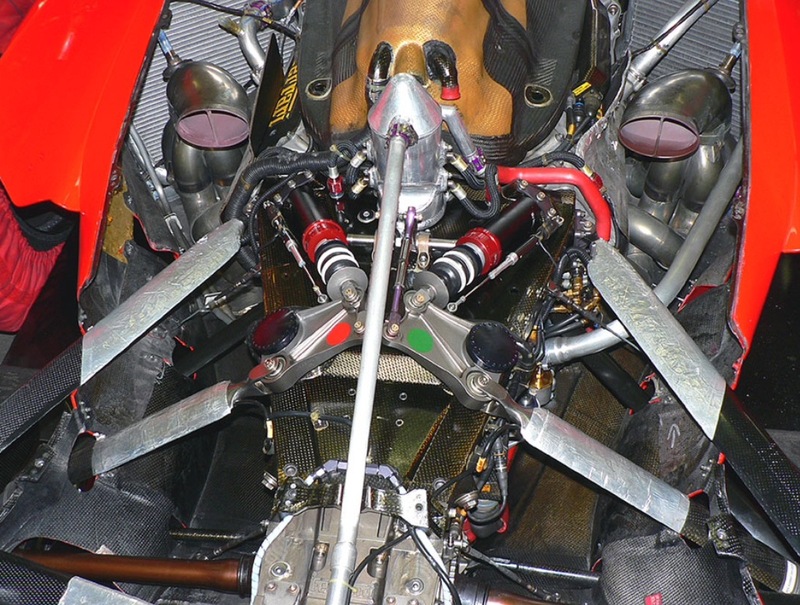 Rear end detail here…upper wishbones and push-rods, springs and shocks. Car pioneered ‘periscope’ exhausts up thru the bodywork to get exhaust pipe lengths right for optimum power. Aussie Willem Toet Ferrari aerodynamicst at the time said the ‘periscopes’ were ‘not the best solution aerodynamically as the side exits, but benefits flowed from tighter rear bodywork’. Extensive use of heat reflective materials, gearbox and driveshafts, carbon fibre undertray and V10 all clear. The cars are not necessarily pretty to look at but the engineering detail is exquisite. 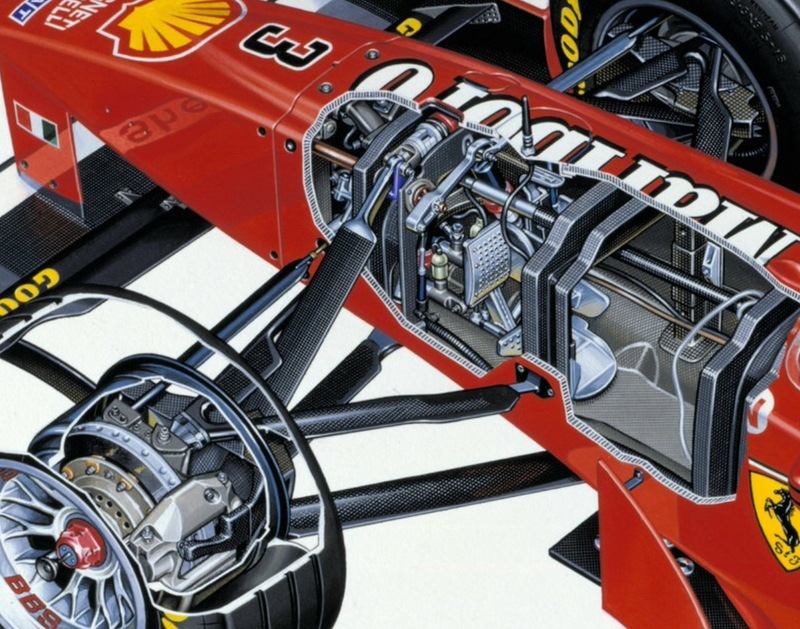 Tony Matthews’ superb F300 cutaway…showing honeycomb carbon fibre monocoque, pedals, 7 speed semi-auto box remember. Pedal detail including master cylinders, roll bar link for adjustment. Upper and lower wishbones, pushrod and top of the spring. Front upright, disc, caliper, Goodyear tyre on 13 inch BBS wheel…tis all there!